“a compelling glimpse into a life spinning out of control. Shortlisted for the Dumfries and Burgh Book award. The Irish Examiner – A triumph of teenage fiction. 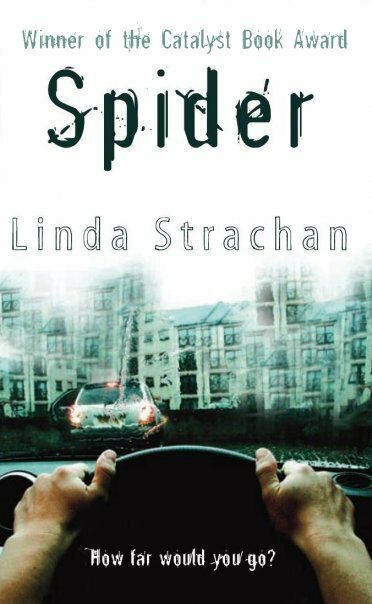 In Spider the author skilfully juggles the voices of three very different teenagers – Spider, Andy and Deanna in a pacy, touching story that never palls ….. the Run – ie racing through a narrow alley in a stolen car – and the consequences of that, are what bind the story in a compelling, insightful intertwining of credible characters. You can almost hear the wheels spin, smell the tyres burn. When the accident happens it’s with a sickening inevitability. We then share the thoughts of the main characters as they await recrimination and attempt both physical and mental recovery. Spider believes it’s entirely his fault for drawing others into his web. Strachan, however, allows the reader to see a bigger picture of leaders and their followers. 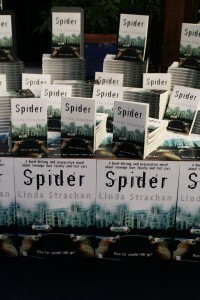 Armadillo – Linda Strachan is such a compelling writer…. My life was sorted. Well, I thought so – I was pretty stupid. Ducking and diving here and there, thieving – just small things, twocking the odd car for a Run. A real peach of a girlfriend – rich too – and I had a reputation as a bit of a hard man.What more could I ask? Some might say I got exactly what I was asking for and maybe they’re right. I just don’t know or care any more. Thought I was so clever; but you can’t hide from some things and when your nightmares come true…. I had one last night. A nightmare. I didn’t sleep much, so it must have been in one of those moments when you just drift off. But it was so bad I woke up screaming silently, shaking and sweating, tears streaming from my eyes, not sure where I was. But that’s probably not surprising, is it? It was shadowy and dark in my nightmare and I was looking at Deanna. She was crying and I couldn’t get her to stop. There was something in her arms but she wouldn’t let me see it. Her hand was covering it and when she lifted her hand for a moment it was dripping with dark red blood. She started yelling at me. “See what you did, Spider!” I wanted to shout back that I didn’t do it; I didn’t mean it to happen. I wanted to tell her that I was sorry, so sorry….